Cheers y’all! Thanks for a great 2014! 2014 has been the best year yet for PrettySouthern.com. We have so much to be thankful for, especially you – dear reader. 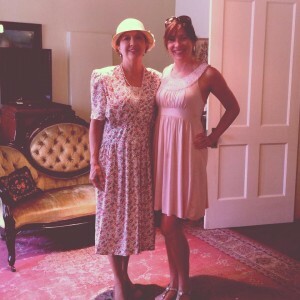 Thank you for coming along as we noshed, sipped, and strolled throughout the South. 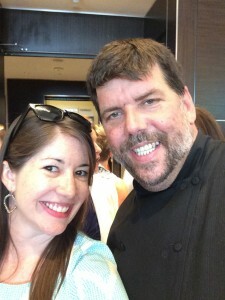 In Atlanta, our home town, the blogosphere continues to grow and we were privileged to join both the Atlanta Blogger Network and Atlanta Food Blogger Society. Our post Words Only Southerners Say reached more than 92,000 people who were looking for Sh%t Southern Women Say and more Southern colloquialisms. We got to travel, meet awesome folks, and are so excited to see what the future has in store. 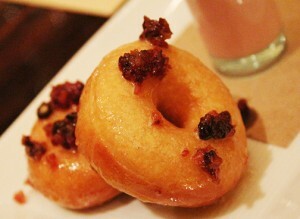 Of course, what really knocked our socks off at BLT Steak was the fabulous, savory maple bacon donut. 1. BLT Steak – if y’all follow me on Twitter and Instagram, you know I blog about food…a lot. 2014 was truly special because I got invited to some awesome tastings. 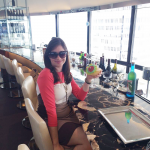 But the best of them all was at BLT Steak at the W Atlanta – Downtown. After naming BLT Steak to our Top 10 Atlanta Steakhouses, we were treated to a preview of their new blackboard menu specials. After more than 10 courses with wine pairings, we were both amazed and stuffed. This wasn’t just the best meal I had in 2014, but arguably the best meal I’ve ever had in Atlanta. 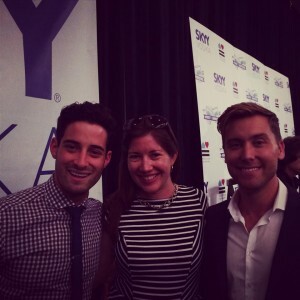 Michael Turchin, me & Lance Bass! 2. Toast to Marriage – On June 16, I joined Lance Bass and his adorable partner Michael Turchin at SKYY Vodka’s Toast to Marriage kickoff. At the W Atlanta – Midtown, more than 500 people turned out to set the world record for the largest linked arms toast. In partnership with Freedom to Marry, the goal was to raise awareness for legalizing marriage in more states and end federal marriage discrimination once and for all. Also, I learned Lance Bass is a Southerner! He’s a Mississippi darling and I loved getting to meet him and his fiancé. 3. A Legendary Dinner – I got to check two more items off my bucket list this year when I met both Vince Dooley and David Greene at Shula’s 347 for Sports Radio 92.9’s legendary dinner. 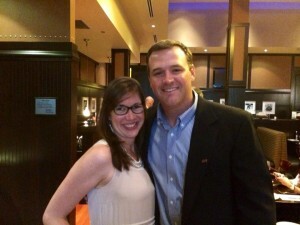 Y’all know I’m a big Georgia Bulldogs fan so this was a pretty special night. Yup. 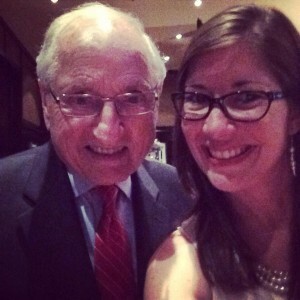 I took a selfie with Vince Dooley. Special thanks to Karen Caravan PR and The Atlanta Food Blogger Society for making this dream come true happen. 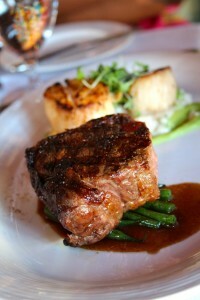 Surf & Turf with N.Y. prime sirloin & seared sea scallops over pea risotto. 5. 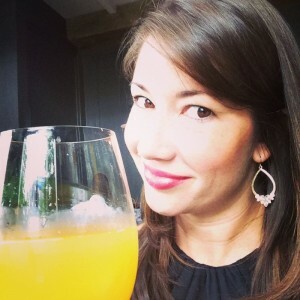 The Little Black Dress Brunch – hosted by the fabulous Erica Key of Eating with Erica at Saltyard, The Little Black Dress Brunch was an amazing way to spend a Sunday afternoon. We sipped bottomless mimosas over multiple tasting courses with the fabulous bloggers from Belly of the Feast, The Great Dana J, We Like 2 Cook, and Local Italian Plate. 6. “It’s All About The Guest” – Davio’s Northern Italian steakhouse proprietor, Steve DiFillippo, penned a book chronicling his experience as a restaurant entrepreneur called “It’s All About The Guest”. He invited The Atlanta Food Bloggers for a five-course meal and conversation. That night, it truly was all about the guest (check out our food pics here) and we especially enjoyed dining with our pals Eve & Roger from Friday Date Night. 7. Atlanta Food & Wine Festival – another item I checked off my foodie bucket list this year was attending the Atlanta Food & Wine Festival. It was a perfect day of sampling cuisine and cocktails from across the South. My favorite moments included meeting Kevin Rathbun, and learning how to make cocktails in batches with Arianne Fielder and Tyler Hudgens, two Southern gals who are rocking the bartending scene, plus Erica Smith from A Taste of Our City and I got to help polish off all the leftover punch from their class! 8. Taste of Atlanta – since we launched PrettySouthern.com in 2011, we’ve been privileged to partner with Taste of Atlanta to help promote this annual event. Our favorite restaurants from our hometown are represented in this 3-day indulgence. The highlights for us were serving as judges for best booth decor, plus the Friday night kickoff party “Culinary Matrimony”. 9. Tastemade – all of these tastings led to making great connections, including Atlanta’s own media maven Mara Davis. This fall, I was invited to help launch Tastemade Atlanta. The Tastemade app (available to download for free on any smart phone) allows you to film videos of your dining experiences, plus add music and filters for customization. It’s a great way to share your favorite places to eat in your hometown. You can see all my #TastemadeATL videos here, and check out this one from Red Sky Tapas. 11. GlowDry Makeover – one of the best parts about being a blogger is getting to help promote local business, and there’s no prettier biz in the South than beauty! 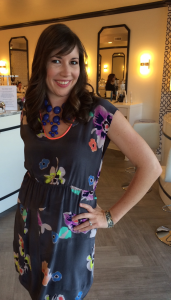 GlowDry proprietor Paige Perkins offered up a free blowout and makeup application in honor of GlowDry’s 1st anniversary (woo hoo!) Y’all can keep up with GlowDry on Facebook, Twitter, and Instagram for specials, including discounted blowouts. 12. Oakland Cemetery – Pretty Southern was invited to join the Oakland Cemetery Ambassadors to help spread the good news and latest happenings at Atlanta’s historic landmark. On our first tour we visited the “graves of the glorious dead” of Bobby Jones, thousands of Confederate soldiers, and many famous Southerners. 14. A Southern Journey – this year I did a solo road trip of 1,100 miles across the South through Georgia, the Carolinas, and Virginia. It was a great way to explore this part of the country I love so much. The South is an enchanting place, quite unlike anything in the world. Accents are sweeter, folks are more willing to strike up a conversation, and even share their life story. 2014 was a year of making new friends, and I owe a few folks shout outs because without y’all I wouldn’t have gotten these amazing opportunities: Allied Integrated Marketing – Marissa Miller, Lee Schroeder, Leslie Hochsztein, Carolyn Sloss; Melissa Libby PR – Alex Kukler; Liz Lapidus PR – Tucker Berta and Kelsey Walker; Kitsy Rose PR, Caren West PR; Karen Caravan; Tara Murphy of 360 Media; Lorrie Dixson of Eskimo Advertising; Debbie & Jody Rosen of The Rosen Group; The Reynolds Group especially Katherine Ames, Andi Hill, Julia Baker, Julia Ott, Erica Hinchman, and all the lovely PR gals; Becca Dorr and The Atlanta Bloggers Network; Denise Romeo & The Atlanta Food Blogger Society. Last but certainly not least, PrettySouthern.com has an amazing team of contributors including Katy Ruth Camp, Kate Robertson, Angela Sun, Jamie White, and Kevin Patrick. If it wasn’t for y’all, Pretty Southern wouldn’t be possible. Cheers to 2014! Thanks for a fabulous 365 days, and bless your heart! Lauren Patrick is a native Southerner, UGA graduate, and the editor of Pretty Southern.com. Y’all can find her writing, wining, and dining in Atlanta. She’s a member of the Atlanta Blogger Network and Atlanta Food Blogger Society. Keep up with her & Pretty Southern on Twitter, Pinterest, and Instagram. It’s pretty cool that you met Lance Bass… Just saying! It really has been an eventful year, and I can’t wait to see what 2015 has in store for all of our fellow bloggers! Love the post and I hope you have a great year!